Last month I broke new ground… I read my very first Brad Thor novel, Black List. What I didn’t realize at the time was that Black List was actually #11 in the “Scot Harvath Series”. Had I realized this at the time, I probably would have started with the first book in the series, The Lions of Lucerne. But that being said, having no previous experience with the Scot Harvath Series didn’t seem to diminish my enjoyment of, or ability to follow the Black List storyline. If you read my review of Black List, you won’t be surprised that I decided to start the series from the beginning. So, did The Lions of Lucerne live up to the expectations that were set in place by reading Black List? Scot Harvath is a former Navy SEAL and the current head of the President’s Secret Service advance team. During the President’s ski vacation in Utah, disaster strikes. In an incredibly well planned and executed attack, the President is kidnapped and dozens of Secret Service agents are slaughtered. Feeling responsible for the kidnapping, and the loss of his team members, Agent Harvath sets out to recover the President and introduce the evil-doers to his form of justice. His task proves even more difficult when, in a surprising twist, he is framed for murder. But this doesn’t prevent Harvath from laying down a trail of hurt from the United States to Europe. I’ll admit that I was a little worried about reading The Lions of Lucerne. After reading Black List, there was no doubt that I would read future Brad Thor books. But there are 10 books, and 10 years, between The Lions of Lucerne and Black List. It stands to reason that Brad Thor’s writing didn’t start off as good as it was in his latest novel. Well, as it turns out, I was worried over nothing. The storyline was great and easy to follow, with the exception of all the Swiss town names and attractions that I’ve never heard of. But in all fairness, I don’t think the story would have worked if it all took place in Middletown, USA. It is my belief that you can gauge the quality of a story teller by how effective they are at making you feel as if you are a part of the story. Well, from the beginning to the end of The Lions of Lucerne, Scot Harvath takes a beating. At times, I almost felt as if I needed an ice pack and some Tylenol to compensate for the beating Harvath was taking. So yeah… I felt like a part of the story! The Lions of Lucerne has tons of content for gun owners! 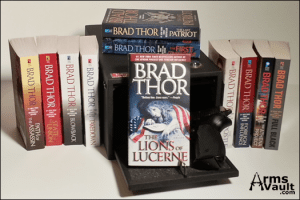 It is obvious that Brad Thor is a gun enthusiast. While many authors are content to refer to a gun by brand name alone, Thor takes it a few steps further. Quite often he goes into detail about things such as caliber, various weapon modifications and accessories. And let’s face it… us gun owners love accessories! In this instance, a magazine would have been the appropriate thing to ask for. From that point, clip was used incorrectly a few more times. I was a bit disappointed by that, but let’s face it… that is a very common mistake. And as I mentioned before, Thor’s later book was flawless on gun terminology. To answer my previous question, yes, The Lions of Lucerne definitely lived up to the expectations I had after reading Black List. It doesn’t take long for The Lions of Lucerne to kick into high gear. And when it does, it really doesn’t stop until the last page. *I’ve already started the next book in the serious, Path of the Assassin. Stay tuned for our review!